The following article written by Rene Agredano recently appeared on the doityourselfrv.com website. Too broke or cheap to pay for one night at an RV park? Don’t even think about free overnight RV parking at truck stops, it’s just not a good idea. There’s a popular belief among many RVers that it’s OK to take advantage of free overnight RV parking at truck stops around America. If you’re too cheap or broke to pay for an RV park and a big box parking lot is out of your way, overnighting in a truck stop parking spot might seem like a good idea — but the long-haul truckers of the highways disagree — and with good reason. RVs are not wanted at truck stops. Like most frugal RVers, I also thought it was OK to park our rig at truck stops. We never had too many issues, but the last few times we parked at truck stops we got jammed in-between dozens of idling, noisy big rigs with only a few feet between us. Truck stops are more crowded than ever and there’s a good reason for that. • Federal labor laws requiring more trucker rest periods mean that truck stops are busier than ever as drivers are forced to take more breaks. As more truckers compete for limited overnight parking spaces, they aren’t happy about seeing RVs on their turf. 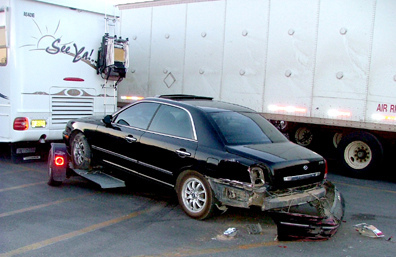 We used to be clueless about trucker’s attitudes toward RVers at truck stops, but then one evening while overnighting at truck stop, a trucker made it clear; he nearly took out our slide! Forget RV parking at truck stops. “We can’t pull those big commercial rigs over just anywhere and enjoy a park or the river or the view or the wind in the trees or a historical site or whatever. We have the truckstop. If you’re a frugal RVer and always on the lookout for free overnight RV parking spots, do yourself a favor and bypass the truck stops. Look for other acceptable and safe free places to park your rig – there’s plenty out there for recreational vehicles like ours. MY TAKE: Though I agree with the article, I want to mention that RVers are still good customers for many huge truck stops. Some (e.g. Flying J) have designated areas for RV parking, specifically for RVs and no trucks allowed. These are OK to stop at and sleep for a few hours if you can’t find anywhere more acceptable, except, as all truck stops, they are busy and noisy places all night long as trucks come and go and idle for hours (running their refrigerated units) while they take their required breaks. You do not want to get on the wrong side of truckers. Many of them have offered welcome assistance to on-the-road RVers in trouble, and are often (or plan to be) RVers themselves. Remember that they are working, earning their living, spending many long, lonely hours on the road, to deliver goods to the American consumer. Be considerate and don’t take up their important resting spots. Well-written above are a bunch more reasons to add to the one that keeps Meg and I clear of truck stops: They are ungodly expensive! Not to park, but if you need a shower or laundromat, it’s hard to find a more expensive place to go. Written probably by a local private RV park discouraging free camping at truck stops. With a little common sense, you can easily park away from truckers. I bet the Truck Stops want RV’s business. If you have a reasonably sized motor home and can find a parking space in the parking lots truck stops are a very good option if you are stuck for a place to duck into. Some states now do not have a lot of rest areas and many people are sleeping in their cars at truck stops like Loves. Nobody bothers them. Truckers are allowed to park there because they shop there. Likewise any traveler who gasses up and eats at a truck stop is welcome to park there. They tend to be noisy but rarely are they so full of trucks there is no other parking available. I have never seen a completely full Loves parking lot. I have never had anything but good relations with truckers. And none of them are going to risk losing their job or insurance by shaving off slide-outs. I have pulled into a Loves and have had attendants there try to wave me right through to the truck section. They are there to sell gas, and providing a place to park for travelers is a great way to sell gas. Many of them, even independents, have restaurants. People have a place to park and rest, they will spend money. Truckers don’t make the rules at the truck stops, the truck stop owners/managers do. Try to steer clear of the truck parking area for obvious reasons. RVers and other travelers money is just as good as the trucker’s money, and most truck stops will accommodate RVers as well as truckers. It’s just good business. As mentioned Flying J often has specialized RV islands and RV Parking. Loves, too. Freelance writer/photographer The RV Lifestyle, Green RVer, hiker, runner, swimmer, kayaker, snowbird, boondocker. My posts on this blog will include (other than RVing stuff), some rants and raves, health and fitness news, and general opinions on whatever motivates me at the moment.